Software Asset Management (SAM) enables IT leaders to take control of their software inventory and investments across the entire organization. 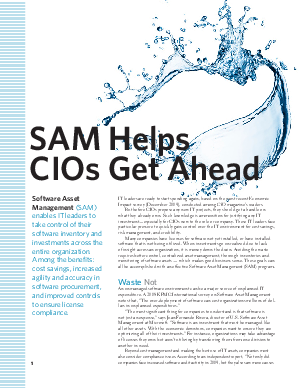 Among the benefits: cost savings, increased agility and accuracy in software procurement, and improved controls to ensure license compliance.IT leaders are ready to start spending again, based on the most recent Economic Impact survey [December 2009], conducted among CIO magazine's readers. But before CIOs propose any new IT projects, they should get a handle on what they already own. Such knowledge is ammunition for justifying any IT investment - especially for CIOs new to the role or company. These IT leaders face particular pressure to quickly gain control over the IT environment for cost savings, risk management, and credibility. Many companies have licenses for software not yet installed, or have installed software that is not being utilized. When investments go unrealized due to lack of insight across an organization, it is money down the drain. Avoiding the waste requires better control, centralized asset management, thorough inventories and monitoring of software assets - which makes good business sense. These goals can all be accomplished with an effective Software Asset Management (SAM) program.